Looks like 2014 was a good year for Google. In a recent report made by AppFigures, it showed that Google’s Play Store has grown dramatically since its conception and has now overtaken Apple’s App Store in terms of total numbers of apps and developers. AppFigures is known for monitoring large platforms of mobile apps and it mentioned that at the end of 2014 Google has beaten Apple in having more number of apps in store. The report illustrated that this is the first that Google Play Store has achieved such feat. Aside from having more apps, Google Play is also known to have more developers for third year in a row, exceeding Apple’s. The Google Play Store has ballooned into having about 1.43 million apps while Apple App Store has about 1.21 million apps. 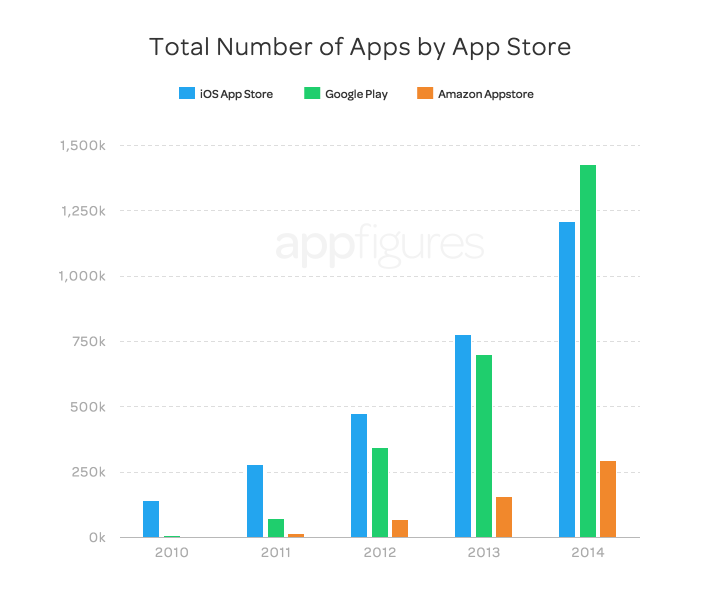 In third but trailing way behind is Amazon’s mobile app store with about 293,000 mobile apps. In 2014, the number of apps developed for Google has doubled while the growth for Apple was found to be just below 60%. Although the raw numbers are leaning towards Google, we should keep in mind that the two are not managed in a similar way. Google allows developers to publish apps directly while Apple does a rigorous review before an app is released. Google only steps in if there are certain violations on Terms of Service or mobile malware distribution. 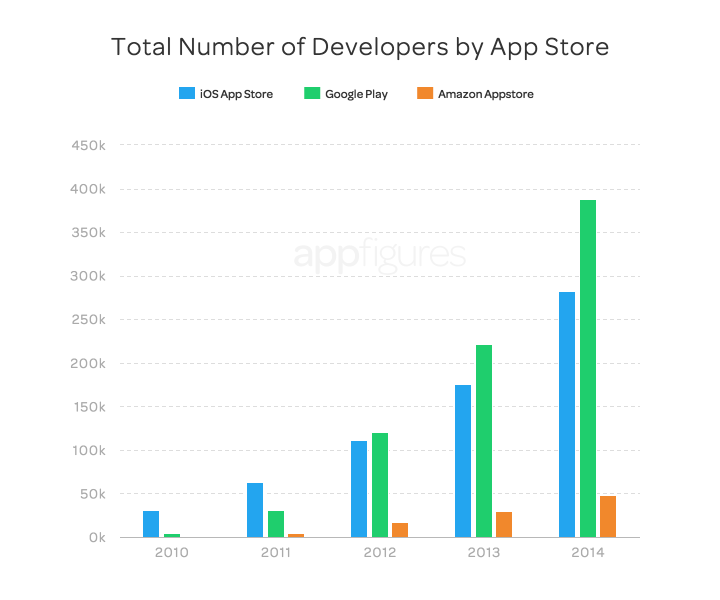 All three mobile app stores seen on AppFigures’ report has seen great growth in terms of number of developers in 2014. Apple had about 50% growth while Amazon had 90%. Coming out on top, Google has 105% growth, which translated to Google beating its competitors. This showed that 2014 was a year of strong growth for all three app stores, with at least 50% increase. Google Play has now about 388,000 developers, Apple has about 282,000 developers, and Amazon has nearly 50,000 developers. In terms of categories, Google’s growth is largely about “Games”, which is followed closely by “Photography”, “Music”, “Business”, and “Entertainment”. Apple’s growth in apps is largely about “Business” with more than 128,000 news apps. Next is “Food and Beverages” and then followed by “Lifestyle”. However, even if Google has surpassed Apple in terms of number of apps, it is important to note that it is not necessarily a measure of preference. Many developers still opt to launch on Apple first because Apple developers are said to be making more revenue, specifically about 60% more money according to analytics company AppAnnie. The growth on Google Play Store hints maturity but it doesn’t translate developer preference.